I thought it appropriate to include a page of art that is related and for this story. I am looking forward to receiving the official print cover from my niece, who is going into manga and will be running her own manga press. Once the print cover is completed, I will post it here. Meanwhile, please enjoy the other images that it will join. This image was created by Marantha Dreamweaver Jennell as a gift, and I will classify this as the first official piece of fanart for the story as it was completely and totally unexpected. I am very glad that she has been following along with the story and glad that she enjoys it. This will ultimately be the cover for an illuminated and illustrated edition of the finished book, which will likely only be available in .pdf format due to printing costs, although I might be able to get it set up for a print version of the illuminated/illustrated edition. That edition will also make use of a special background for the pages that was also designed by Marantha Jennell. However, this is not the only cover for the book. This image was a collaboration between myself and my daughter, and was intended to be the cover for the standard edition of the ebook. Once the story is finished and ready for compilation, be watching for it on Amazon, Smashwords, Barnes & Noble, and more. This image may also end up as a flyleaf in all editions. 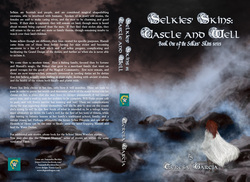 This image is the official cover for the print editions of "Selkies' Skins: Castle and Well" which is the first book of the Selkies' Skins series (excluding the prequel booklet). The background art is by my niece, Samantha Buckley, who works in a variety of styles, and is currently working on a comic. She may be available for commission for covers. The official banner for the story, this was designed for use on the Web Fiction Guide website. However, I still haven't figured out the protocol for getting it on my story's listing. If you like, feel free to use that image to make a bookmark for your books. By now, you've likely seen this little one on the most recent installations of the story. This little seal is the divider image that will be used in ebook and print editions. Say hello to the cover for the Ornaments short story, also available as an eshort on Smashwords. Depicted on the cover are Etain and Finnol's birthyear ornaments for Kirsten (the youngest, and the white one) and Justin (the eldest of the children they would have had in the household). I'm thinking about writing a short sometime to illustrate what in my story a half selkie child will look like when born. I was needing to draw a little just to relax, and because it had been so long (or felt like it). 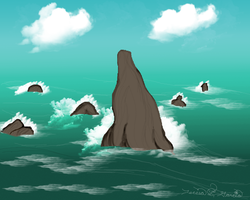 I wanted to work with water, and seastacks are something that always inspire and relax me. I can imagine Kirsty testing herself out here. More art will eventually be added to this page. If you like the story, I do encourage fanart. I just ask that if you do fanart, you send me a copy so that I can archive it, and that you credit me by giving the name of the story and pointing to it so that people know where they can read. If you post your fanart on somewhere like DeviantArt I also ask that you send me a link so that I can link to you. At this time I don't encourage fanfiction about the characters or story, because it's not fully available yet and I'd like to be the one crafting the characters in reader's mind, for the time being. HOWEVER, once the storyline is finished and in physical print, you can write me for permissions. I also ask this because once I'm done writing the storyline then I'd be able to read the fanwork without accidental influence, so that I can support back.